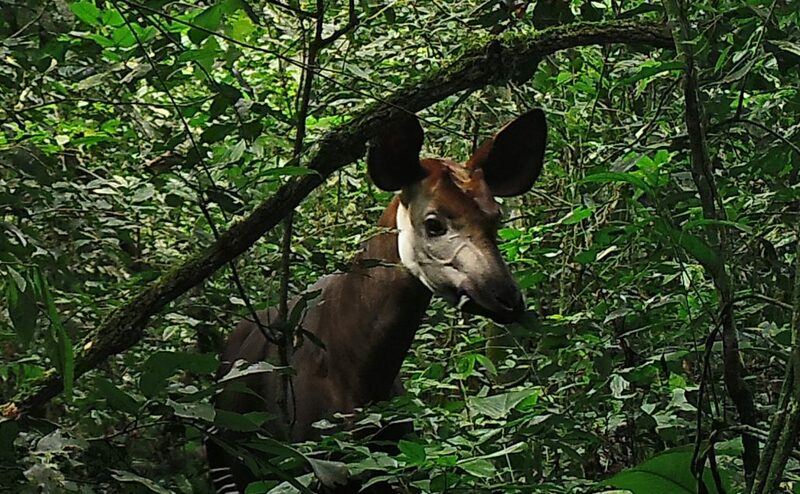 This amazing camera trap video of a young male okapi foraging on the slopes of Mount Mbia is remarkable for a number of reasons. The okapi is feeding only 2 km from Epulu where 5,000 people work and live and not far from the main road through the Reserve. This exemplifies that our double-pronged approach of supporting protection of the forest zones and engaging communities to respect wildlife is working. We have always felt that the signs of okapi we have observed and the recent camera trap data we have collected indicate that okapi can coexist with people living in small villages with low population density. This camera trap video adds evidence to support our hypothesis. Watching this video invokes feelings of wonder and deep satisfaction in me. This is a wild okapi doing what they do most of the day – quietly and firmly plucking leaves from trees and bushes. From these brief 15 seconds, we can learn a great deal. The forest is healthy, the okapi is healthy, it is just after noon when okapi should be active, and the animal is totally relaxed in his natural environment that has hardly changed over the last 6 million years. You can understand by the density of the vegetation why okapi are so big and strong – they need to push their way through this maze of vines, saplings, trees and bushes all day long to eat leaves that power their lives, giving them the energy to defend their territories, mate and raise offspring. Conserving what could quite possibly be the most elusive large mammal on the planet is unquestionably a challenge. 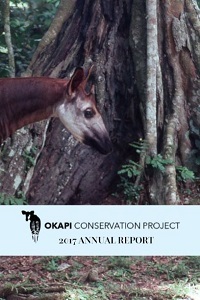 As our partners, the brave ICCN wildlife rangers work to expand protection for all wildlife living in the Okapi Wildlife Reserve, OCP staff will continue to work with communities inside and outside the Reserve to reinforce the link between healthy forests and healthy okapi populations.